The end is near for Friday Fish Dishing. During the weeks of Lent, leading up to Easter, Small Bites has been bringing you many different fish dishes. I jumped on that bandwagon too, creating some fun and interesting dishes with fish. Today I have my take on Sea Bass, Chilean Sea Bass to be exact. I decided I really wanted to “step things up” with this one. I love bringing you simple and easy recipes to create, but every once in a while it’s nice to add a few extra components to impress your guests … but still keeping things simple in the end. 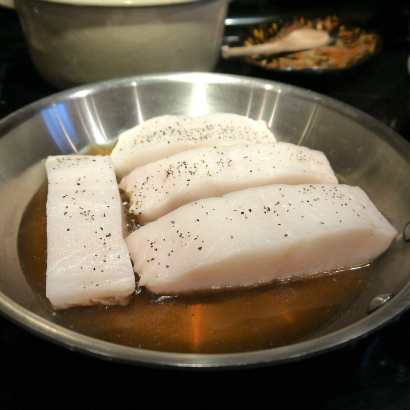 First things first: yes, I did use Chilean sea bass for this recipe. There are a few different types of “sea bass” available. You might see “Giant” or “Striped” before the name, and they are actually sea bass. “Chilean” is technically Patagonian Toothfish. 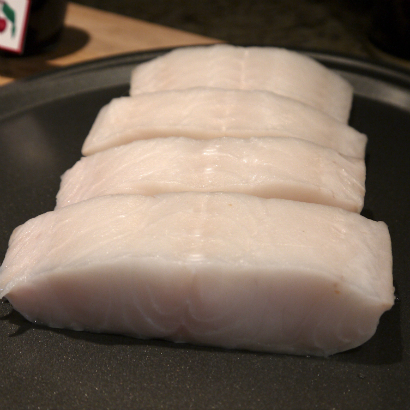 The texture and taste is very similar to sea bass, hence the connection. Sea bass is loaded with great nutrients: not only is it extremely high in protein, but also a great source of Potassium. It’s dense texture lends itself to many different cooking applications, like grilling, poaching and roasting. 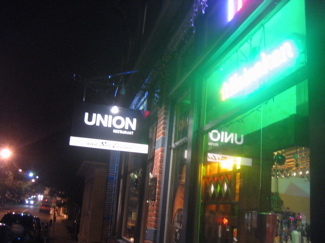 When I popped into my favorite fish shop Port Chester Seafood, that is what Lou had available, that day. He also told me up front that it was previously frozen. He knows I’m not a fan of the “previously frozen” fish! However, that is how this particular fish is transported. Similar to octopus, it would just not make the journey otherwise. Reluctantly I said, “ok.” I needed sea bass, and decided that this would be a perfect opportunity to really test the product. Once I got it home I started raiding the cabinet. Lou suggested I poach it, but what could I use? I’ve never done a tea poach, so I figured, why not try now? 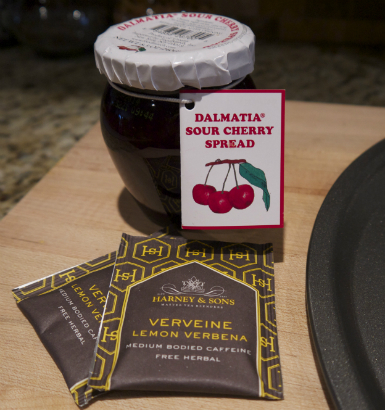 I also spotted a jar of Sour Cherry Spread in the cabinet and a plan was taking place. I needed some thing to go with it and knew I had a bunch of beets in my downstairs ‘fridge … the same color as the jam. This is literally my process some times: I look at one ingredients and then I start to pull things together as I see them. It’s wildly creative and so much fun! While getting the beets I grabbed the remaining kale I had in a bag, left over from soup I made the day before, and some farro off the pantry shelf. My basic ingredients for the dish: fish, tea, jam, kale, farro and beets. I got the beets going first, using my basic beet recipe. I simply trim them and place in a pot with cold water with 1 tablespoon each of kosher salt and demerara (raw) sugar. This is how I made them (on a much larger scale) at Tarry Lodge. The sugar and salt combo brings out the sweetness of the beets. Once the are done, remove them from the pot and allow them to cool for about 5 minutes. 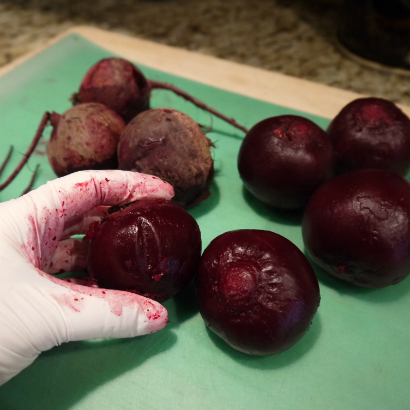 Very important note: place them on a separate cutting board and use gloves – unless you are ok with having red fingers and a stained cutting board. After peeling them simply slice them or cut in wedges. While the beets are warm you want to add your dressing. It can be as simple as vinegar and oil. 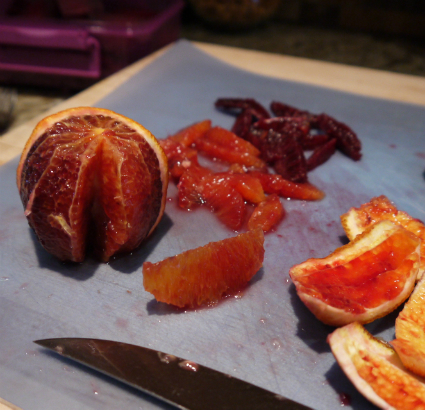 Having a few blood oranges I decided to use them. I “supremed” them, and squeezed the juice from what remained. Along with the juice I used an Orange Balsamic vinegar I got for my birthday from my friend Denise. My vinaigrette combination was 1/4 cup orange juice, 2 tablespoons of balsamic and 1/4 cup of oil, with a couple of pinches of salt and pepper. I used half on the beets and half to dress the kale-farro salad below. Set the orange sections aside for garnish. 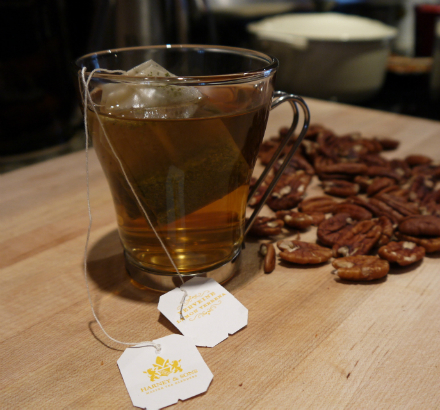 In the meantime brew 2 lemon verbena tea bags in 3/4 cup of water. I used Harney and Son Verveine. 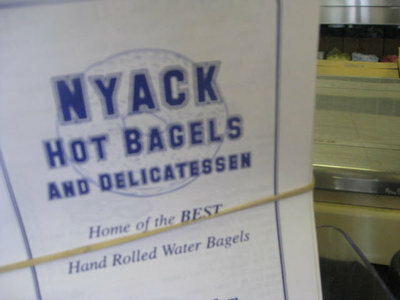 I’m a huge fan of that brand, and have a wide selection of their flavors. If you are not able to find that locally, just look for lemon verbena. That was my flavor profile. I steeped the tea for about 5 minutes and then placed it in a medium sauté pan and brought it to a simmer. I poached the fish for about 5 minutes on a low simmer. 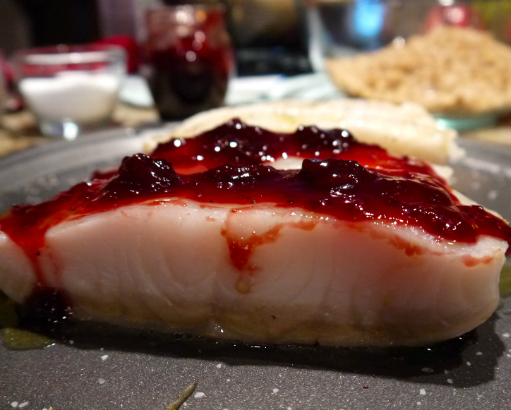 Carefully remove the filets to a non-stick platter and topped with the jam. The jam is chunky so you can either puree it a little or just keep it chunky. I liked the rustic look of seeing the whole cherries so I opted to go that route. Either way will work, what you are looking for is the contrast of the tea flavor and cherry combining with the fish. I broiled the filets for just about 5 minutes on low. You only want to finish cooking the fish, not burn the top. The last part of the dish was the kale and farro salad. While the beets were cooking I made a small pot of farro. Farro is easy to cook, similar to rice. 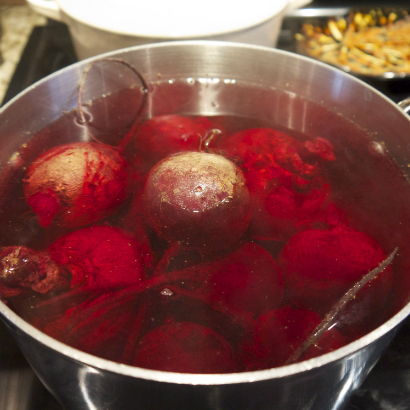 The cook time is just about the same as the beets, 20-25 minutes, maybe a little less. So they can be on at the same time. For the kale I simply pulled the thick rib out and sliced the leaves thin. I sautéed in a little olive oil for 5 minutes, removed from the heat and tossed with the cooked farro. I dressed with the remaining vinaigrette and for a little crunch I added some toasted chopped pecans. I also think if you want to go really simple spinach would be completely perfect here as well. Just toss with the vinaigrette and serve with the beets. Ultimately you are always looking for flavor, color and texture. So starting with the sea bass as the center of the dish, you can work with a variety of different sides that will be lovely: spinach, chard, broccoli or even asparagus. I would only suggest that you have some type of leafy green for the fish to sit on, along with the vegetable on the side. I hope you had as much fun as I did with this year’s Friday Fish Dish series. 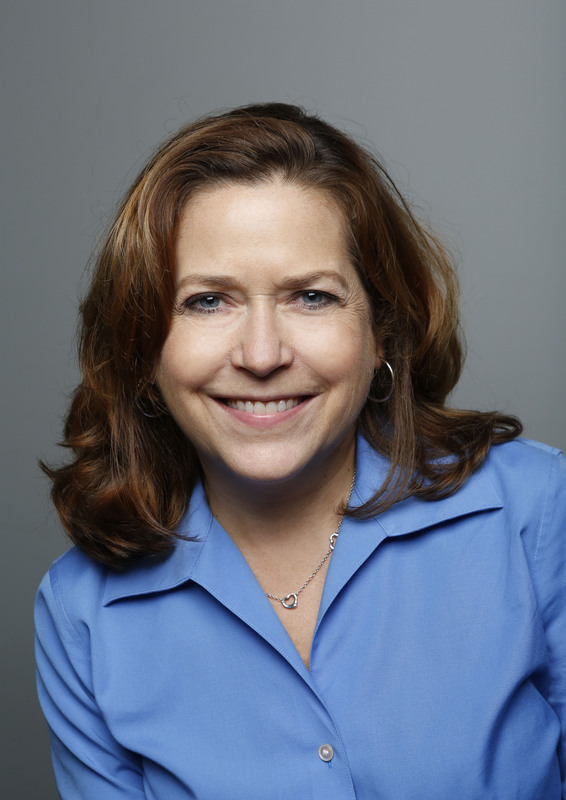 I would also like to wish everyone the happiest of holidays this week and weekend. 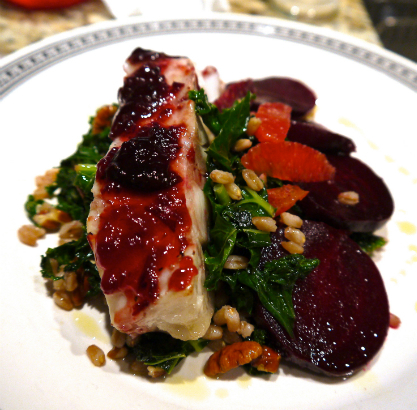 For the recipe, visit Lemon Verbena-Sour Cherry Sea Bass with Citrus-Flavored Farro, Kale and Beets. Next Article New Poll: What Will You Serve for Easter Dinner?